“Quality sells and how”. But quality comes at a cost. People don’t mind paying the extra buck for quality. The cost can be made up for by the premium that a market is willing to pay for quality. Let us first see how much an SME can be impacted by quality. Most SMEs work on credit and are generally mid-level suppliers to either larger players/retailers/brands. Apart from the fact that these players don’t place orders with SMEs who are not quality conscious, the SMEs end up getting large debits on goods which are not up to the quality standard of their customers. This eats up any cost savings incurred by supplying sub-standard material. For a corporate, brand value depends a large extent on quality. Two garment brands X and Y have similar product lines (polyester-cotton blends). X invests widely in branding with major stars such as Shah Rukh Khan donning its garments. The other is conservative with respect to advertising however it spends heavily on quality. Both get the fabric and garments manufactured from outside. Y has a team of 6-7 people which keep on monitoring the fabric and the garment quality. Y’s sale is much higher than that of X since the garment quality is relatively better on multiple parameters such as color fastness, weaving defects, garment shrinkage after wash etc. How does a production unit ensure quality? There are simple steps which units take to minimize quality defects. The RM used must be of top-notch quality. Any compromise on the RM can have a disastrous impact on the finished product. Finished products also have manufacturing costs attached to them. 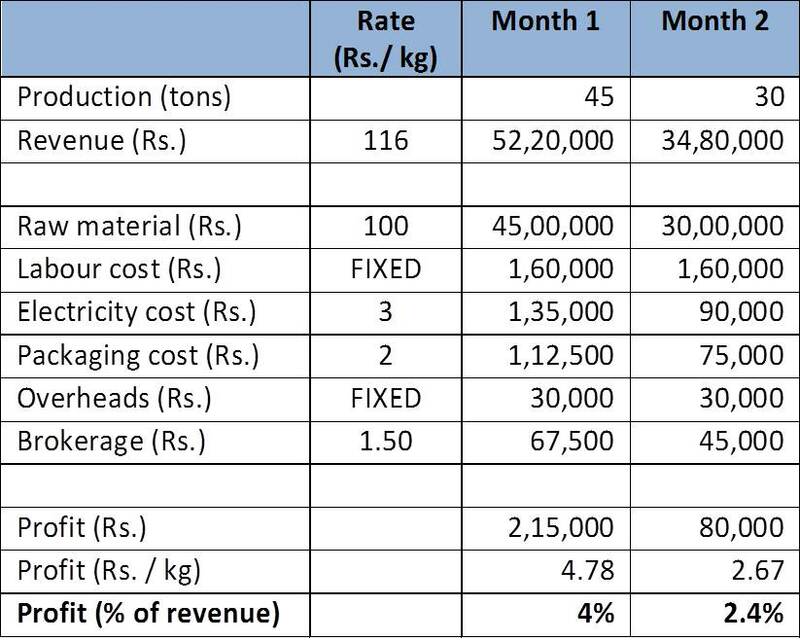 Sub-standard finished products may end up with a high discount price which discounts both the RM price and the manufacturing costs and could lead to a heavy loss. Good RM also has a positive effect on efficiency and can inherently lower manufacturing costs. The above example is not to illustrate that cheaper RM is necessarily of lower quality. It is just to show any compromise on RM quality can be disastrous in terms of value loss and customer perception. Units tend to standardize RM quality over time by fixing vendors. Production Managers prepare a list of vendors who supply RM, shortlist the top few in terms of quality. Once the shortlist is prepared, purchase can then be made on the basis of price. Large RM batches must also be tested for basic parameters before taking them in production. Many SMEs are averse to taking on quality checkers since they add to running costs. However, quality checkers can be critical in minimizing value loss. Most manufacturing processes always have intermediates and are continuous processes. If the intermediate products are checked, any quality defect can be captured and fed back to the start of the manufacturing process so that defects can be avoided in new batches. Defects are generally due to unexpected working of machines, errors by human operators or problems in RM. If captured early on in the process, one can modify the working to minimize further loss. Also, the manufacturing process for intermediates which have been damaged can either be avoided or modified so that one faces minimal cost of production for “B/C Grade” products and hence minimal loss. Too many quality checks may however be counter-productive both with respect to cost and timely delivery. It is the role of the production manager to identify where the manufacturing process is defect-prone and quality checks are necessary. It is not just the production manager and the quality checkers who are responsible for quality. The entire unit must be involved in this process. Efficiency and quality can sometimes be mutually exclusive outcomes. Technicians, in such cases, tend to over-emphasize efficiency and underplay quality. It is necessary to make the technicians, supervisors and laborers believe that quality is an important and critical perspective. Technicians and quality checkers in most units are at loggerheads with each other. This is an expected outcome since incentives for the technician are designed to promote efficiency. It is hence important for the production manager to achieve a balance between efficiency and quality. These are a few steps that in my experience can lead to better quality manufacturing. Once word spreads that a particular unit is quality conscious, there is no shortage of customers.